The shooting of WDBJ reporter Alison Parker and camera man Adam Ward during a routine live shot last week left the country speechless. For journalists, particularly TV reporters who work daily in the field like Parker and Ward were, their brutal death was personal. Vann, who’s managed stations in Cincinnati, Savannah, Ga. as well as in Illinois, Iowa, the Carolinas and New York, says news folks accept some risk with the job, but this event was unthinkable. Broadcasters around the country were visibly numb. “This is a TV reporter’s worst fear, especially for those of us one-person-band reporters,” said Nia Hamm, of News 12 Bronx and Brooklyn. She writes, reports, and shoots her own stories. Hamm must capture all angles of the story and watch her own back at the same time. Veteran video photographer Tony Thompson knows all about that. During Thompson’s 25-year career, he’s covered every type of live shot imaginable; he left the news business a couple of years ago. Today, he works for the A/V communications department for the city of Springfield, Ill., but the same rules apply. Reaction to the shooting permeated the entire media community, not just TV folks. 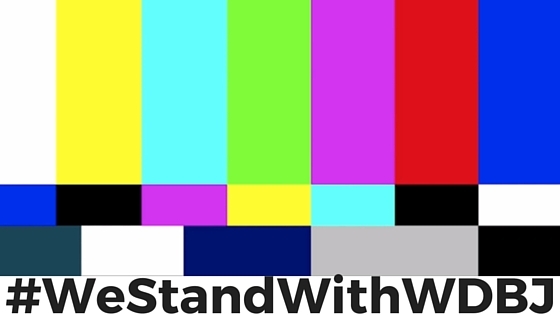 Nationwide, #WeStandWithWDBJ photo and video tributes from newsrooms showed support for WDBJ. Many journalists posted TV bars on their social media pages to show solidarity. The senseless, cruel death of these young Virginia journalists has raised questions around newsroom security and operations. WISH’s Vann says he plans to work with its security company along with station employees, staff and the news director to determine the best course of action regarding station security. Whether you work in media or not, losing one of your own on the job can leave longtime scars. Life coach and motivational speaker Jerry Gladstone (@JerryGladstone) advises those who experience sudden and horrific loss to not isolate themselves and maintain a good support system of family and friends. It’s important to allow yourself to grieve. Scholarship funds have been set up in honor of Alison Parker and Adam Warner by their respective alma maters. Please click on WDBJ here for more information on how you can give.